PLATINUM PROMO + 200 POINTS — Stay at an elegant hotel & create your own fun with an Explorer Pass® (trip does not include In-destination Support). Escape the everyday with a well-deserved DreamBreak in New York City. Whether you’re a local or a visitor, this new travel option offers you a fresh way to experience your DreamTrips™ Membership, starting with a 2-night stay at an upscale hotel. This DreamBreak does not include an In-destination Support team member so you can create your own adventures, your way. To maximize your enjoyment, download the DreamTrips app, and earn points as you dine with DreamTrips Local at top-rated NYC restaurants recommended by DreamTrippers just like you! The Big Apple. The City That Never Sleeps. Empire City. New York boasts many nicknames but has no equal in the modern world. It’s diverse, packed with culture, humming with excitement and bustling with round-the-clock energy. Discover the heart of NYC and customize your own adventure with a complimentary New York City Explorer Pass. Enjoy admission to 3 attractions and tours of your choice from more than 60 popular options — from museums and galleries to sightseeing cruises and bicycle or walking excursions — with no need to pay at the gate! 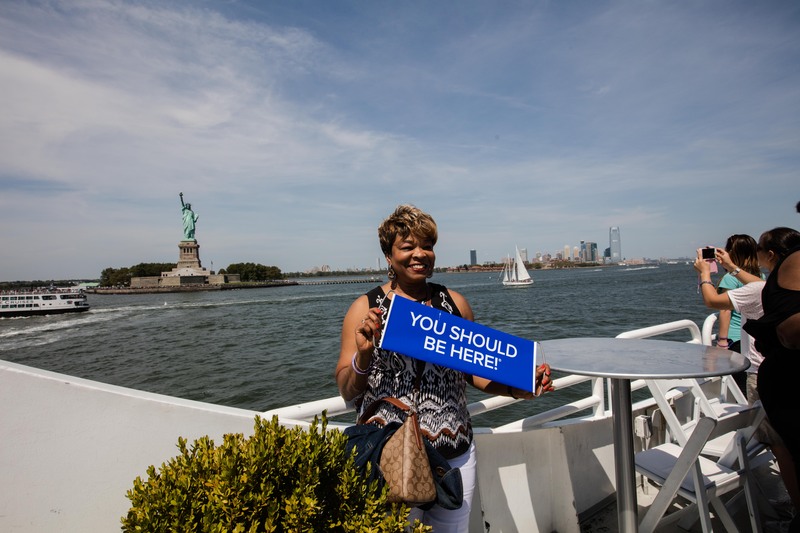 You can see the famed skyline during a ferry tour of the Statue of Liberty and Ellis Island, then visit the Empire State Building or the Top of the Rock® Observation Deck for a different perspective. Or, consider a cultural outing with a visit to the Metropolitan Museum of Art, the American Museum of Natural History or the Whitney Museum of American Art. For a change of pace, venture out on a bicycle tour of Central Park. Just pick your top 3 tours or attractions to visit and go! During your stay at the luxury hotel, Conrad New York, you’re also within walking distance of Battery Park, the 9/11 Tribute Museum, SoHo, Tribeca and more — putting self-guided shopping, culture and sightseeing opportunities at your fingertips. •	Your New York City Explorer Pass is valid for 30 days, and offers unparalleled access to some of the city’s top attractions and tours. Pick 3 and create your own trip itinerary! •	Conrad New York has consistently held an elite spot on the list of Manhattan’s best luxury hotels since its opening in 2012. •	New York City Explorer Pass (1 pass per person). Click here for more information. Airfare is not included in the trip price! The closest commercial airport to the hotel is LaGuardia Airport (LGA), approximately 15 miles (24 kilometers) away. We highly recommend that you purchase travel insurance for any trip. This trip will close by February 15. Conrad New York, located in the heart of lower Manhattan, boasts a 15-story lobby of bold colors and design, showcasing a 10-story artwork called “Loopy Doopy.” The hotel is conveniently located near Wall Street, the 9/11 Memorial, Greenwich Village, Battery Park and New York Harbor. •	Atrio Wine Bar & Restaurant and Loopy Doopy Rooftop Bar. •	Accents New York gift boutique, florist and barber. •	Self-parking: US$60 per day, or US$75 per day for oversized vehicles; valet parking: US$65 per day, or US$80 per day for oversized vehicles. •	1 king bed or 2 double beds. •	430 square foot (40 square meter) 2-room suite. •	Bathroom with rainfall shower. Gratuities are not included. We suggest providing US$5 per day for housekeeping and US$9 per bag for porterage. • Pass includes admission to each attraction. • Pass includes 1 visit per attraction. • Some attractions may offer upgrades or special exhibits for an additional fee. • Please review the website details carefully, as some attractions require a reservation — these will be indicated with a special symbol. Some attractions require a credit card to hold a reservation (by the attraction directly). In these cases, your credit card will not be charged unless you do not show up for your reservation. • If you are interested in taking the Gossip Girl Sites Bus Tour or NYC TV & Movie Bus Tour, we suggest that you pick up your tickets as soon as possible after arriving in the city. Name Change Policy: Name changes must be done no later than February 15 and are subject to a US$50 name change fee. Name changes after this date are not allowed.